Is the thumb screw(after being cut) still used to keep the blade in place (secure)? Hello noob here, I followed your tutorial through my conversion. Great step by step forsure. Have two questions for you. 1) with the new blade holder it comes with three screws, where do the go? 2) For the safety screw, tried to screw it back in but after I tried to get it in, the screw would not fit. So I stripped it by forcing it in. So I used a 10-24 which seemed to do the job but the holder is a tad loose. Any advice? P.s. if I cut too much off the thumb screw could I use the "safety screw" as my blade retention screw? Thank you in advance. The safety screw can be replaced by any 10-32 threaded button head screw to secure the blade, but I don't believe it was long enough by itself to reach the blade. The kit is designed to be held in place by the 10-32 safety screw, so if you were to replace that with a button head, it should also secure the socket better. You can use the 26 guage, it will work just fine. "The wires are as follows: Brown, Red, Orange, Yellow, Green and Blue are the positive leas for the main led. These can be bundled together and will go to the main blade led's positive pad, or simply removed from the board altogether and replaced with a single wire." "The violet and gray wires are the blade cut-off switch. These will need to be connected to each other later, and do not need to be removed"
"The white wire is the negative for the clash sensor. If you did not order a replacement sensor, de-solder and remove the stock one from the blade connection housing on the blade." You do not have to remove the wires from the board, but it does make the wiring a lot cleaner. You would need to simply strip the ends of those positive leads for the led strip blade far enough to solder them all together, then add a single wire to run to the blade led positive. The white wire is also the ground for the original led strip, and that would go to the blade led negative. If you attach the sensor to the board as shown, you will not need to insulate it, since there's nothing in the hilt that will touch them. If you attach the clash sensor to wires, then yes, you'll to insulate the connection, with heatshrink tubing being the recommended method. so the clash sensor gets connected to the positive ( brown, red, orange, yellow, green , blue) and to the white to complete the circuit? also do you think i could run a 6watt LED offered by saberforge? about the sensor, i see now after reading it a few times it would go from the gray/purple wires to the white wire. The soundboard is unlikely to be able to supply enough current to run that led, you'd be better off using a single for this conversion. Actually, no, it goes to the white, purple and gray wires. The gray wire is the ground, the white is the IMP or impactwire, with the purple wire being the PRE, or prevent circuit, which prevents the saber from being activated without the blade inserted. That circuit must be closed as well, or your saber will not function after the conversion....see why I desoldered the board and rewired? ok well i have ordered all the parts earlier today to do this conversion! i was fiddling with my saber when i thought about how the chrome finish is coming off the corners of my activation box... are there any good tutorials on how to replace the switchbox from a plastic one to an aluminium one? has anyone done it? I'd like to convert my Hasbro Luke Skywalker ANH 2010 removable blade lightsaber. 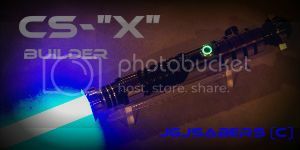 I found this instruction on the net and I need your help and advise about choosing the LED for my saber. (I can order the kit from the saberproject but i living in hungary and the postage is very high, so i have to do it on my own). First question is what efficiency (watt) is the best for me, because I do not want to discharge the battery quickly but I need a shiny blade. I found 1W, 3W, 5W Power LEDs, which would be the best choose? The shop where i can buy this LEDs i only found 30,45,90 (degree) lens, shoud i search smaller degree lens?